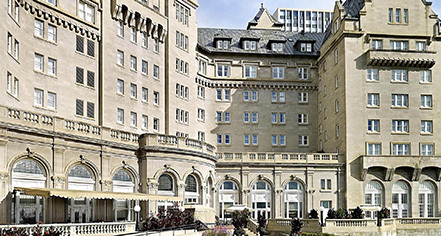 Situated just above the North Saskatchewan River, the Fairmont Hotel Macdonald has been a recognizable fixture in the Edmonton, Alberta skyline since it opened in the summer of 1915. While the hotel was an active part of the community for many years, it closed in 1983. After sitting dormant in ill-repair, the hotel was rescued from demolition by being recognized as an Alberta Municipal Heritage Resource in 1985. After this designation, the hotel was re-furbished and once again opened its doors to the public in 1991, retaining all of its original character. Throughout the years, the hotel has hosted many celebrity guests and even royalty, such as King George VI and Queen Elizabeth. With its most recent renovation in 2017, the Fairmont Hotel Macdonald is a luxury resort and Edmonton’s only four-star, four-diamond hotel. 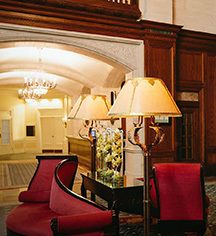 The Fairmont Hotel Macdonald features 198 well-appointed guestrooms and suites that offer a comfortable, warm atmosphere to guests visiting Edmonton. The hotel boasts 2 full-service restaurants complete with elements of outdoor dining, experiential live painting, and seasonal barbecues. Guests can enjoy the fitness center, saline swimming pool, sauna, steam room, whirl pool, and hot tub. Therapeutic massage and other treatments are also available to guests of the hotel. While exploring the grounds of the hotel, guests will discover the largest indoor garden center in Canada, as well as over 10,000 square feet of meeting and event space. As the hotel is located in Edmonton’s downtown district, the Citadel Theatre, Edmonton City Center Mall, Shaw Conference Center, and the Alberta Aviation Museum are within a short drive or walking distance of the property. Over 50 golf courses abound in the area, as well as excellent steakhouses and farm-to-table restaurants. Guests can enjoy music at the Francis Winspear Centre for Music, a game at Rogers Place sports arena, and the inquisitive TELUS World of Science as they explore this world-class destination. Fairmont Hotel Macdonald, a member of Historic Hotels Worldwide since 2018, dates back to 1915. Fairmont Hotel Macdonald is one of the first two establishments to be reissued their liquor license in 1924 when Prohibition was repealed. ATM: Located in the Lower Lobby. Deposit: Varies by rate selected. Early Check-In/Late Check-Out: Based on availability; additional fees may apply. Extra Person Fees: $20 per additional adult. Hotel/Resort Fees & Taxes: A tax of 12.24% applies (5% GST, 4% AB Tourism Levy, 3% DMF). Parking: Parking is available. Self-parking is $35 a day, valet-parking is $45 a day. Pet Policy: Pets are allowed for $25 per pet, per day. Transportation: For Fairmont President’s Club members, there is a complimentary luxury BMW hotel car service. Situated just above the North Saskatchewan River, the Fairmont Hotel Macdonald has been a recognizable fixture in the Edmonton, Alberta skyline since it opened in the summer of 1915. While the hotel was an active part of the community for many years, it closed in 1983. Learn more about the History of Fairmont Hotel Macdonald .